The relative peace Nigeria enjoyed in recent time almost gave some kind of conviction that sectarian/religious conflict, riots, and communal fights etc in Nigeria was over. But the latest development in Bauchi, Bornu, Kanu and Yobe States which claimed not fewer than 400 lives and many others seriously injured and others displaced from their homes in northern Nigeria, apparently called for worry over how porous our internal security is, in Nigeria. One cannot forget so easily the Wase, Langtang,Yelwa and Shendam crises of 2004 which its devastating consequences deposed the then Governor of the State Joshua Dariye and gave room for the reign of an Emergency Rule, which was headed by Chris Ali. 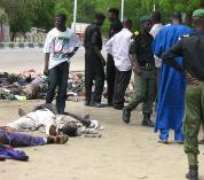 Those experience were far unbearable for the Plateau State inhabitants, both the Fulanis, and the indigenes. Also the burning, maiming and beheading of human beings who were mainly Christians in cities like Kano in the yesteryears are bizarre stories that are difficult to get off one's memory. Looking at this recent imbroglio in Maiduguri and other affected parts of the Northern Nigeria, what simply comes to mind is that there is still more work to be done by the Ministry of Information and Communication in terms of orientation. Pathetically, Police say most of the dead are militants, from a group that wants to impose Taliban-style rule (although the group has no known affiliation with Taliban fighters in Afghanistan). The Islamist group Boko Haram (Education is illegal), has launched attacks on police stations five Christian churches were destroyed, and a Protestant pastor was killed, leaving 100 dead. The group wants a wider adoption of Islamic law across Nigeria. It obvious that violence has become a common way of expressing political frustration in Nigeria, the ongoing restiveness in the Niger Delta, a southern region roiled by a struggle over oil money, is a signature to that assertion. After eight years of rule by an elected southern Christian, all the main political parties nominated northern, Muslim candidates for the 2007 presidential race. Some said that was a necessity in this former British colony roughly split between a Christian-dominated south and a Muslim north where Arabs had ancient footholds. President Yar'Adua, who comes from an aristocratic Muslim family in the north, won the election. But he has struggled to overcome questions of legitimacy after thugs openly purchased votes, stole or stuffed ballot boxes, and intimidated voters. About 200 people arguably, died in election-related violence. Yar'Adua also is challenged by a long-standing kidney ailment. His detractors say his health, charges he won power through fraud and his cautious personal style have made for an supposed ineffective administration. Nigeria should be wealthy, with its copious oil reserves, but corruption and inefficiency have left most people impoverished. Despite promises of reform, Yar'Adua's government, like its predecessors, has failed to deliver even basic services like piped water and electricity. Reports have it that Nnambi Obasi, senior Nigeria analyst with the International Crisis Group, told Vatican Radio that the conflict is not between Muslims and Christians per se. However, one would wonder if there were no intelligence reports informing that such an unfriendly attack would visit Nigeria. It is good for our government at all levels and all security operatives in the country to intensify efforts by ensuring that internal and external security of lives and properties are given utmost priority. Again, it won't be out of place if Mr President summons some individuals to answer questions over this sheer security laxity in the interest of Nigeria to avoid recurrence of such threats in future. Notwithstanding we would still give it to the Nigerian Police and the Military personnel who put in place necessary machinery to curtail the unrest, otherwise the ugly situation would have degenerated to a full blown holocaust.